Mangy goes nuts about chiffon cakes, so I make it fairly often at home. While I usually get a really nice fluffy cake, I struggle to reach the heights of store bought chiffon cakes. I tried tweaking my recipe in all sorts of ways with no luck. Until one night, I had a brain wave. Perhaps, my tin was simply too large for the recipe I was using? I whipped out the measuring tape and true enough, it was double the size I needed! I wasn’t too keen on simply doubling my regular recipe, cakes can be a little finicky that way. So I thought I’d find myself a new recipe and it was a hit! Just the perfect quantity for the tin I had. I made a few changes as usual, my version below. Pre-heat oven to 180°C. 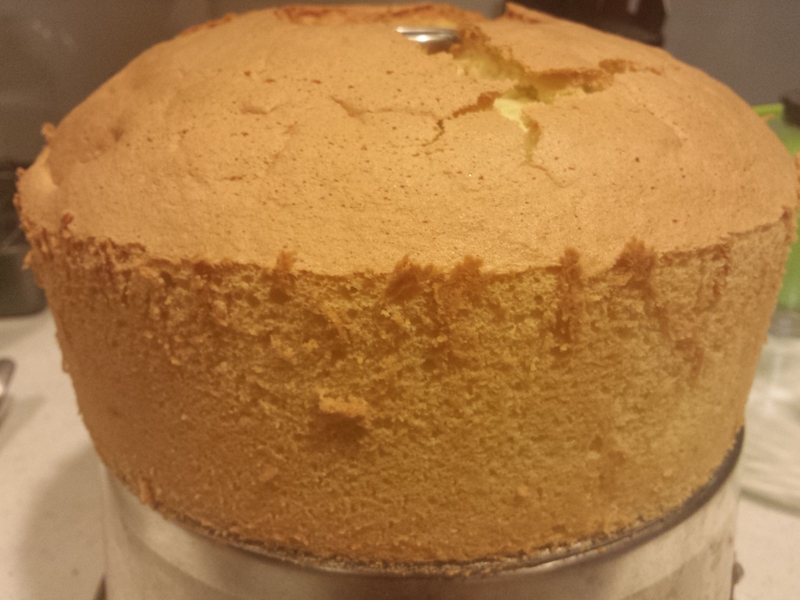 Prepare a clean 25cm chiffon cake tin, do not grease or line tin. Sift the flour, baking powder, coconut milk powder and baking soda into a bowl. Whisk together egg whites and cream of tartar. Add sugar in 3 parts until egg whites begin to stiffen. Once stiff peaks are formed, set egg whites aside. In a another bowl, whisk the egg yolks, oil, water and sugar together. Add dry ingredients and whisk well into a smooth batter, there should be no lumps. Set aside. Stir in approximately 1/3 of the meringue into the flour batter. With a spatula, fold in the egg whites gently and mix well. Add the rest of the egg whites and repeat the folding process till the cake batter is well combined. Scoop from the bottom of the bowl to ensure no meringue or flour batter is left unmixed. Pour the cake mixture into the cake tin. Using your skewer, dip it into the batter right to the bottom and make circles around the tin twice. This is to remove any large air bubbles possibly trapped while pouring in the cake batter. Use your spatula and smoothen the top of the batter gently. Bake at 180°C for 10 minutes. Lower the temperature to 170°C, cover loosely with foil and bake for another 45 to 50 minutes or until cake is done. The cake tester should come out clean. Remove the cake from the oven and immediately overturn it to cool completely. Once cool, release the cake by running a sharp, thin knife along the sides and bottom of the cake tin. The cake should fall right out. Enjoy! Most, if not all chiffon cake recipes will have the egg white whipping stage last. However, I always start with this step first. It saves on having to wash and dry the whisk. When whipping egg whites, the whisk needs to be very clean and very dry, otherwise your egg whites will never stiffen. The same does not apply to whipping egg yolks. So I find it easier to start with the whites and use the same whisk for the rest of the batter. If you work quickly enough, your egg whites will sit happily and won’t collapse.